Racing Age/DOB: 27; June 19, 1988. Current Residence: Grand Rapids, Michigan. Racing Strengths: Time trial, all around. 1st place Maple Hill Road Race. 4th Overall General Classification 2013 Redlands Bicycle Classic. Goals for 2016: Contend for the win at US Professional Time Trial National Championships, and prove my overall ability by winning one or more NRC stage races. Personal Hobbies/Interests: Ice Hockey, Astronomy, acoustic guitar. First Bike: 1997 Lemond Tourmalet. What would you be doing if you weren’t cycling? Probably physical therapy school. Favorite Training Ride: 6 Gap loop in North Georgia. 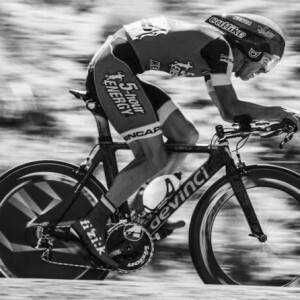 If you could race any cyclist (dead or alive) who would it be and what discipline: Frankie Andreu! It would be fun to race Frankie in any discipline. If you could write the first line for your personal Wikipedia page what would it say: Big Gulps huh? Toughest race you’ve done and why: Tour of Utah because over 700 miles and 51,000 ft of climbing in 7 days. What cycling accomplishment are you most proud of? Back to back podiums at US Pro Time Trial Championships. Any unique pre-race routines or lucky charms? I listen to Dr. Dre’s Chronic 2001 album.